Crystal Reports 9 is the latest in a long and celebrated series of report writers for personal computers. It's by far the best-selling report writer package in the world. If you want to produce a top-quality report quickly, Crystal Reports is the top choice to do the job. 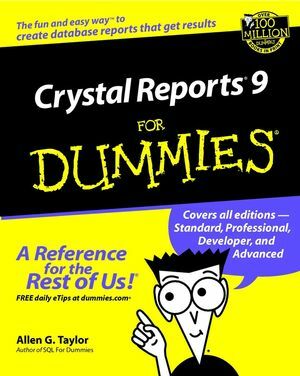 And Crystal Reports 9 For Dummies will get you using Crystal Reports quickly and effectively. It covers all the major capabilities of Crystal Reports but doesn't bog you down in intricate detail. It is also valuable to managers who may never personally produce a report, but have oversight of people who do. This guide will tell you what is possible, what you can do easily, and what takes a little more effort to accomplish. Create a report, what a good report should accomplish and what it should look like. Make your reports more focused, more readable, and easy on the eye. Distribute your reports – from printing, exporting them to files, or faxing them to making them available on a local area network, or uploading them to the Web. Incorporate Crystal Reports into applications written in a computer language. Because Crystal Reports is included as an integral part of Microsoft's .NET application development environment, you can incorporate the power of Crystal Reports into applications you write in Visual Basic, Visual C++, and Visual C#. With Crystal Reports 9 For Dummies, you can produce reports fit for the eyes of the organization's CEO. Each chapter deals with an individual feature that you may need at one time or another. In many cases, step-by-step procedures are given for commonly needed operations. You might find it worthwhile to lay the book beside your computer and perform the operations as you read about them. Soon, you'll be producing outstanding reports with a minimum of effort and in the shortest possible time. Allen G. Taylor is a database consultant with more than 30 years of computer industry experience. His many books include Database Design For Dummies and SQL Weekend Crash Course. Chapter 1: Transforming Raw Data into Meaningful Information. Chapter 2: Build a Report Right Now! Chapter 3: Report Design Guidelines. Part II: Moving Up to Professional-Quality Reports. Chapter 5: Pulling Specific Data from a Database. Chapter 6: Sorting, Grouping, and Totaling Result Sets. Chapter 7: Mastering Report Sections. Chapter 8: Formatting Your Reports. Part III: Advanced Report Types and Features. Chapter 10: Displaying Your Favorite Hit Parade with Group Sort. Chapter 11: Making Correlations with Cross-Tab Reports. Chapter 12: Adding Formulas to Reports. Chapter 13: Creating Reports within a Report. Chapter 14: Combining Report Elements with OLE. Chapter 15: Creating and Updating OLAP Reports. Chapter 16: Enhancing Reports with Charts. Chapter 17: Adding Geographic Detail with Maps. Part IV: Publishing Your Reports. Chapter 18: Getting Your Reports to Your Audience. Chapter 19: Displaying Reports Online. Part V: Programming with Crystal Reports. Chapter 21: Programming with Crystal Reports .NET. Chapter 22: Ten Things to Do Before You Create a Report. Chapter 23: Ten Ways to Give Your Reports More Pizzazz.